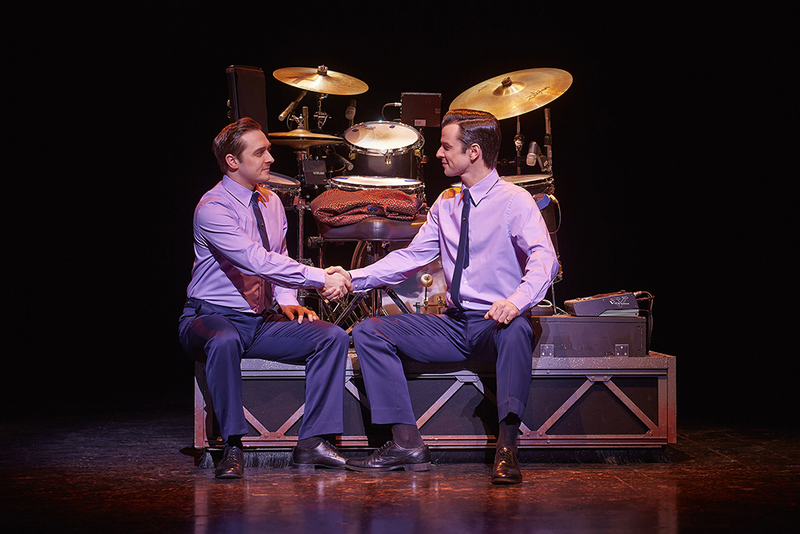 Some might remember the last time I watched Jersey Boys in the West End. It was 14 months ago and I left the theatre rather disappointed. The show I had been supporting for six years was lacking something and I just didn’t enjoy it anymore. I decided to take a break back then and I stuck to it (apart from one visit to the Broadway production last September). But on Saturday I found myself taking my seat in the Piccadilly Theatre for the first time since that not so enjoyable performance in May 2014. Normally I don’t review a show again and again but I feel like I have to make it up to the show because it is such a vital part of my theatre going past in the West End and I don’t want my last words about it in this blog to be “It is no fun anymore”. So, just like last time Sandy Moffat was on for Frankie Valli. I admit I was worried because I just didn’t like his performance the first time I saw him. But it really needs to be said: Sandy has grown so much over the past months. His Frankie is well-defined and his vocals are good. He looks at ease on stage and handles the big numbers in the show well. He is not the most charismatic or unique Frankie but he fits in perfectly with the rest of the cast and delivers a great performance. Ben Wheeler’s Tommy De Vito (understudying Jon Boydon) is just as outstanding and wonderful to watch as ever. He has been with the show from the very start and it is a joy to see how much effort he is putting into his performance. As a repeat visitor you will find little nuances that are one hundred percent unique for Ben’s Tommy. As a first time visitor you will see a perfectly balanced portrayal and one hundred percent commitment to the role. Edd Post is still in the show playing Bob Gaudio and he does so with a cheeky charm and great vocals. 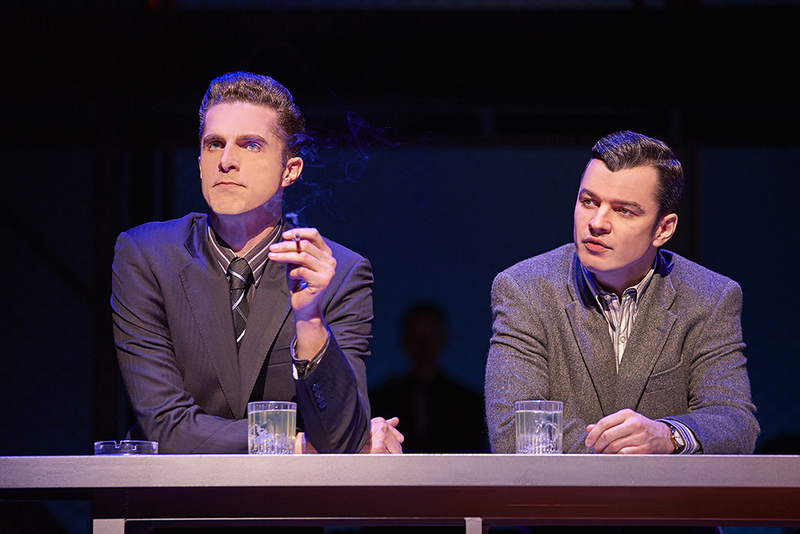 His Bob Gaudio goes from insecure young boy to “Bobby Businessman” in a convincing way – it’s a very slick and professional performance. And despite having been with the show for years Edd’s portrayal feels fresh and full of life. Gary Watson has joined the cast as Nick Massi in March. I have seen Gary in a few productions over the years (from Saturday Night Fever to A Chorus Line and Fings aint what they used t’be) and he always struck me as a great singer, actor and dancer. In Jersey Boys the acting part is what it is most about and I was curious to see how a rather boyish looking Nick would work in the show. First of all, I am not easily pleased when it comes to Nick. So far only two actors have managed to convince me with their portrayal (Philip Bulcock and Mark Isherwood). Gary’s performance is solid and I can’t fault his portrayal as a whole. I’m not sure I like his intonation though. His voice seemed unnaturally deep and his Nick speaks with a strange slur that doesn’t do anything for me (apart from making me think Nick might have more than just a taste for alcohol). He leaves every single one of his sentence open which means some of Nick’s very on point one liners don’t come across as well as they should. But all in all I think Gary is a good addition to the cast. I have heard people praise his performance which is great – it doesn’t matter I’m not one hundred percent sure about his portrayal if the paying public enjoys seeing his take on the part. I’m not going to mention every single member of the current cast but I have to name a few more. Simon Adkins has returned to the show as Bob Crewe. 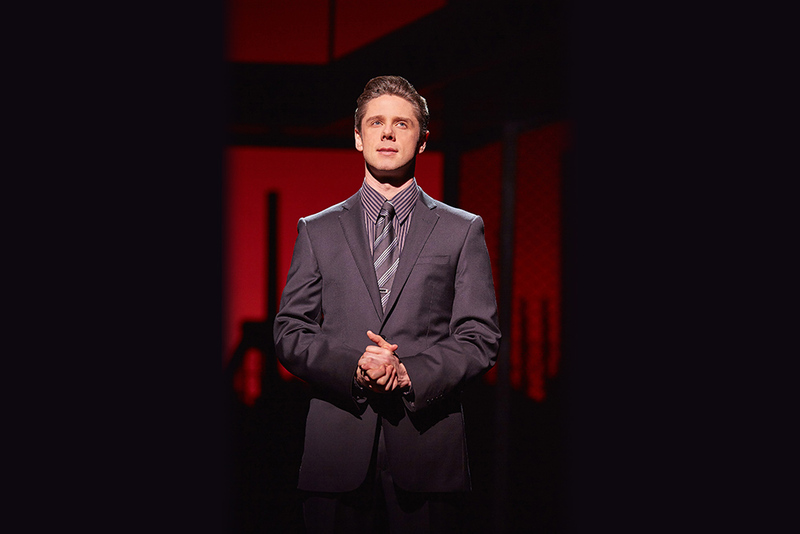 There really are no words for how much I’ve missed him in Jersey Boys. In my eyes Simon is the ultimate Bob Crewe. No other performer has ever come close to his portrayal. In short: I am over the moon to have him back in the show. Mark Isherwood’s Joey Pesci (understudying Matt Thorpe) is a pure delight to watch. He might not be the perfect fit for Joey but the fact he pulls of such a great performance nevertheless just shows what a great actor he is. Last not least: Matthew Hunt’s Gyp de Carlo (understudying Matthew Cutts). At first I thought he might be too young but I was definitely wrong. He oozes authority on that stage and just makes it work. He delivers a very impressive performance and is definitely my favourite new face in Jersey. The rest of the cast does a good job. The show is in great shape which makes me happy. I will never be a dedicated return visitor again – those days are behind me now. But it’s good to know that I can pay my former second home a visit now and then and be sure I will have fun and leave the theatre with a smile on my face. I saw it once many years ago and was really surprised by how much I loved it. Glad to hear you enjoyed it this time. What else do you recommend that’s currently on? I used to watch Jersey Boys all the time. Big Ryan Molloy supporter and I just loved the show. I’m happy it’s regained a bit of that sparkle from the old days for me now. Not currently on but starting soon: The transfer of In the Heights. I saw it at Southwark Playhouse last year and adored it. Beside that there are some good plays at the National right now. Three Days in the Country is good fun and I enjoyed Everyman. Also Gypsy if you haven’t seen it. It’s a stunning production. I’m going again next month. Alice Underground at the Vaults is still on until the end of the month incase you are interested in something different (site specific and immersive). I loved Everyman and Alice Underground. I’m planning on going back to the latter before it closes. The Motherf*cker with the Hat was good at the National. I’m going to see 1984 tomorrow. Excited.